Will the Real Greek Stand Up? Greek yogurt in the States continues to evolve from the original fermented and strained whole milk product that debuted in retailers’ refrigerated dairy cases just a few years ago. Many recent innovations that carry the verbiage “Greek yogurt” can be found throughout the grocery store, in particular the snack food aisle and the frozen dessert freezer. They’re even making a name for themselves in foodservice, not only as a cultured dairy product (used in fruit parfaits and as soft-serve) but also as a cooking ingredient and condiment. For an immediate overview of this trend, please read an article I recently wrote for Food Business News that can be found HERE. In a nutshell, many, including me, are a bit concerned that some of these products are diluting the promises of traditional (strained) Greek yogurt, including power (from protein), indulgence (from fat) and satiety (from both). But don’t get me wrong, I appreciate all innovations that attract new consumers to the dairy products category and result in increased consumption of dairy. So, if calling a product “Greek” helps, so be it. Two soon-to-be launched “Greek” innovations for the dairy case have been formulated to appeal to the calorie-conscious consumer. They come from the top-two national yogurt brands: Dannon and Yoplait. 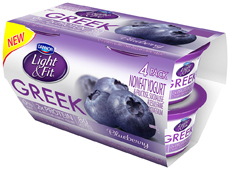 Dannon Light & Fit Greek comes in four-packs of 5.3-ounce cups, a deviation from the 4-ounce cup standard in most multi-packs. This line of nonfat yogurt is able to keep calories low (at 80 per serving) through the use of a sweetener blend comprised of fructose, sucralose and acesulfame potassium. Product labels tout the fact that a serving contains 45% fewer calories and two-times the protein of regular low-fat yogurt. (Each 5.3-ounce cup contains 12 grams of protein.) Varieties are: Blueberry, Cherry, Strawberry and Vanilla. Yoplait Greek 100 will be available in stores across the U.S. by August. The company says the product delivers all of the benefits of Greek yogurt--thick and creamy texture and two times the protein of regular yogurt--in 100 calories. The product’s package will carry an endorsement from Weight Watchers with a PointsPlus value of two per serving. Yoplait Greek 100 adds to General Mills’ expanding line of Greek yogurt products, including Yoplait Greek Parfaits with Nature Valley Granola and Yoplait Greek yogurt multi-packs in Blueberry, Cherry Pomegranate and Coconut flavors, introduced earlier this calendar year. New Yoplait Greek 100 comes in six flavors: Black Cherry, Kiwi Lime, Mixed Berry, Peach, Strawberry and Vanilla. What intrigues me about the U.S. “Greek yogurt” phenomenon is that if you go to Greece, what you will find is that they don’t call their strained yogurt “Greek.” It’s just yogurt. But when you are there, occasionally you might stumble upon something referred to as “American yogurt,” and it’s not very popular, as it contains a bunch of ingredients that the Greeks (and actually most of the world) view as foreign. For American subscribers to the Daily Dose of Dairy: Have a lovely Independence Day holiday! The Daily Dose of Dairy will be on vacation for a week. Publication will resume Monday, July 9. Do You Need a Side Job? Savvy dairy products marketers recognize the value in getting their brand in front of potential customers every possible moment. This often includes the most unlikely foodservice situations, such as the “on-board for purchase snack box” available on most flights over two hours, as well as hotel breakfast buffets and even Starbucks’ a la carte self-serve case. 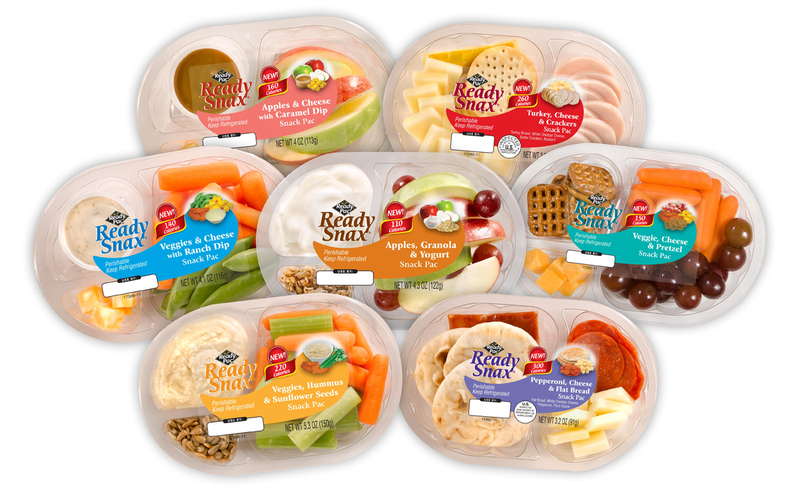 There’s a growing opportunity in both foodservice and retail in the category of pre-made salads and snacking kits. Read about this business boom in an article I recently wrote for Food Business News. With that, I’ve always thought that bulk yogurt suppliers missed an opportunity with the increasingly popular hand-made fruit and yogurt parfait by not touting the brand of yogurt on these containers. 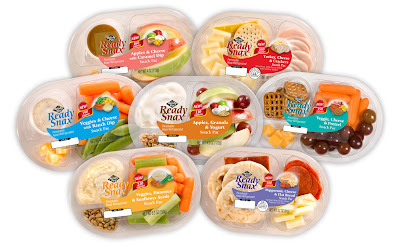 Maybe that comes in the form of a sticker that also offers other information, such as the nutritionals or the “sell by date.” Dairies can do that with the next generation of pre-made salads and snack kits. Salad dressing manufacturers do it. So why can’t the packet of cheddar shreds or the yogurt for apple dipping come in a branded package? The Food Business News article describes a new type of package that allows supermarkets to put together their own kits. This is probably the first of many such package innovations that will fuel the growth of this category. 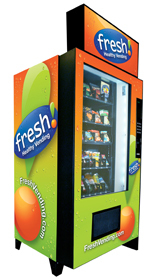 Now is the time to start thinking about how your products can be a side or accompaniment to such convenience foods. You’ve heard it. You’ve felt it. You know it. Breakfast is the most important meal of the day. In fact, 93% of Americans agree, but only 44% say they eat breakfast every day, according to recent MilkPEP research. I am going to guess that this number is even lower in the summer, when later nights turn in to lazy mornings. But this might be the time of year where breakfast is even more crucial, in particular increased intake of fluids to start the day fully hydrated. And this does not mean more tea or coffee, as caffeine functions as a diuretic. Milk makes breakfast simple. Milk hydrates, nourishes and even provides protein. The latter is a nutrient we need more of in the morning, according to research presented by Donald Layman, professor emeritus of nutrition at the University of Illinois at Urbana-Champaign, my alma mater, at the Dairy Council of California Functional Foods Task Force in April, of which I am a member. Layman says that data support higher protein intake levels than the Recommended Dietary Allowance, which is based on minimum needs to prevent deficiency, and suggests that daily protein intake should be spread equally between morning, midday and evening meals. This is a huge opportunity for dairy, particularly in the morning, when protein intakes need to be boosted. This could easily be accomplished by a cold glass of refreshing milk. Of course, milk pairs well with cereal, but it also does a fantastic job of washing down pancakes and scrambled eggs. 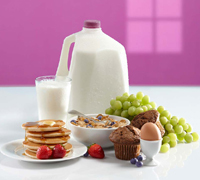 Dairy product marketers—processors and retailers—would be smart to promote the inclusion of milk in the morning with all these types of breakfast foods. MilkPEP has the tools to help. According to data from the NPD Group, breakfast products account for a mere 8% of grocery store sales. Yet, consumers also recognize that products from grocery stores offer real cost savings. Out-of-home options are nearly three times as expensive. Milk is a nutrient-dense, affordable breakfast food. The goal of The Breakfast Project is to keep the milk and breakfast conversation flowing by creating real-time content and conversation about breakfast at home that processors and retailers can easily leverage. Check out the website, TheBreakfastProject.com, which serves as a “content hub” or home base for all MilkPEP Breakfast at Home consumer content, including tips, articles, recipes, videos, statistics, celebrities, experts and more. Throughout the year, Salma Hayek will represent The Breakfast Project to both general market and Hispanic moms for themselves and their families. Salma will promote the idea that “every good day starts with milk” across all media, from TV to print and from PR to digital channels. Check out the first commercial HERE. So, if you have not had breakfast yet, grab a glass of milk and embrace the day! Do You Have Plans to Connect with Kids Come September? That’s because for the Berry household, today is day one! Most kids, including mine, have less than 104 days before they return to what will likely be a changed lunch landscape in schools—public and private—across the country. Some changes are required by law, while others are being made voluntarily. All are in an effort to improve the nutritional profile of the foods and beverages made available to students from elementary school age to Ph.D. candidates. Most public elementary school districts welcome the dairies that supply milk and other products to “connect with the students” via nutrition education materials and other health-related promotions. If you currently have such an outreach program in place, please share as a comment on this blog so that others may learn from your great ideas. After all, most of us are in the dairy industry because of our passion for the wholesome nutrition dairy products provide, from the quality protein in cheese to the essential fatty acids and calcium in ice cream to the powerhouse of nutrients packed into a glass of milk or a cup of yogurt. The countdown begins for the start of the 2012-2013 school year. Make sure your dairy products comply with regulations, appeal to the taste buds of students and are actively promoted as a source of quality nutrition—starting at breakfast and going all the way to refueling after the big game. Milk is once again making headlines in Hollywood, and this time not because it’s Harvey’s last name. Rather, actress Charlize Theron will introduce viewers of Snow White and the Huntsman, a Universal Pictures film that debuts today, to her youth- and beauty-obsessed evil queen character’s age-defying regime: milk. Though the film includes many lines from the classic children’s story, there are definitely some adult-only twists and turns, including the fact that the most important part of Queen Ravenna’s beauty regimen should be kept refrigerated. That’s right…it’s milk! But not consumed, rather, poured into an oversized, built-for-a-queen bath tub where she soaks for hours on end to defy the visible signs of aging. If you do an internet search on the use of milk for skin beauty, there are recipes for facial masks, body scrubs, tub soaks and lotions. I remember older women in my family who swore by Rose Milk, a hand and facial cream from the 70’s and 80s’s that smelled like roses and contained skim milk powder. Its tagline was (and still is, as the product is available for purchase online): For Softer, Smoother, Younger Feeling Skin. It’s the same nutrients that do the body good inside (when consumed) that are recognized for slowing the skin’s visible aging process through physical application. Further, milk’s inherent lactic acid is recognized as an exfoliant that washes away dead surface cells to help the skin shine. So, why am I writing about this? Well, if this is what it takes to get aging moms (like me) to buy more milk, then why not go with it? How about a promo to drink one more glass of milk while soaking in a milk bath (most economically made through the addition on milk powder) or relaxing with a milk mask? Offer some recipes. By the way, I think this afternoon will be spa day at the Berry home.